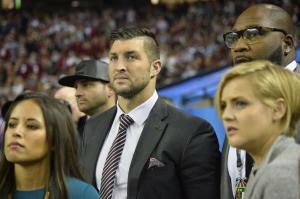 May 4 (UPI) — Tim Tebow and Vladimir Guerrero Jr. each went deep during a Double-A clash between the Binghamton Rumble Ponies and New Hampshire Fisher Cats. Tebow’s Rumble Ponies came away with a 10-6 win against the Fisher Cats Thursday at NYSEG Stadium in Binghamton, N.Y. The former Heisman Trophy winner kicked off the scoring. Tebow stepped up to the plate in the bottom of the second inning to face Fisher Cats starter Jon Harris. The right-hander tossed in a ball, before Tebow tattooed his second offering for a three-run shot over the left-field fence. Binghamton maintained the scoring advantage until Gunnar Heidt’s RBI single for New Hampshire in the top of the fourth inning. Guerrero — one of baseball’s top prospects — stepped up to the plate in the top of the fifth frame with his team already leading 4-3. He settled in against Rumple Ponies starter Mickey Jannis. Vlad Jr. worked a 1-1 count against the right-hander before mashing his third offering deep to left field for a solo shot. Tebow finished the night 1-for-4, with three RBIs, three strikeouts and a run scored. He also left five runners on base. Guerrero went 2-for-5, with an RBI and a run scored. Guerrero is hitting .388 with three home runs and 27 RBIs on the season. Tebow is hitting .230 with two homers, 11 RBIs and 38 strikeouts for the Rumble Ponies. The Rumble Ponies and Fisher Cats clash again at 7:05 p.m. Friday in Binghamton.